What’s so special about the kid and the semi??? I really don’t get the first one. 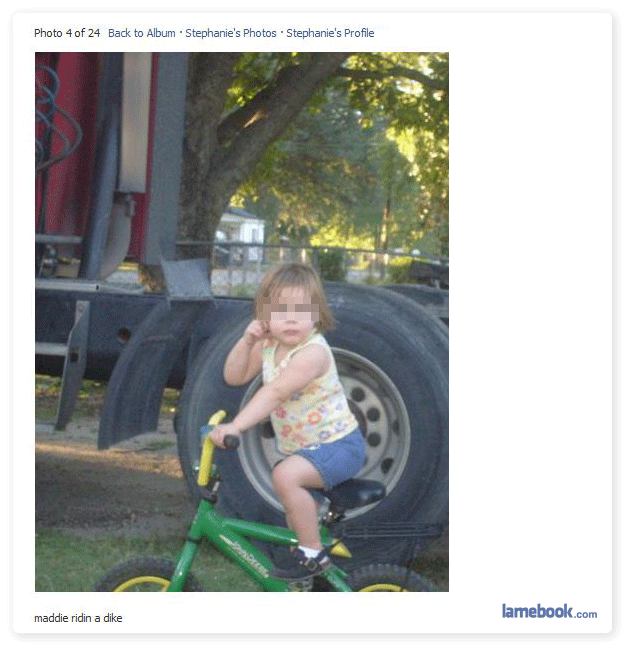 Wallace says the little girl is riding a dike. I quite enjoy riding dikes myself. Shenae is the wynd baneeth my wengs. Lastly, dear Shenae…ah damn, I got nothing for you. Run along, now, lest you be forced to red. You need to up your dose, Keona. Or lower it. nexus, what are you talking about? Shenae, please allow me the honor of being the father to your first abortion. Keona, I think nexus is implying you sound cuckoo. That’s just a wild guess, but. You can easily tell Maddie likes to drink from the furry cup, eat the fur-burger and lick the lesbo stamp because of her masculine haircut and butch body. The girl is already wearing birkinstocks! Isn’t that the official shoe of lesbians? #zigs thanks for clearing that up. Although, I don’t see how in the hell my comment pointed towards being cuckoo. He/ she probably missed the joke. Maddie’s shoes are atrocious. Perhaps that sounds more sane.